This post about workplace dress is partially inspired by posts from Out of the Bag, Blue Collar Red Lipstick, and on The Cut. I rambled quite a bit about how I approach dressing for work in my comment on Out of the Bag's post. In sum: I make what I consider visibly different-from-average fashion choices at work (I dress more colorfully and in slightly more casual silhouettes) and I do so to express something about myself (that my personality is a little more good-humored and less stern than possible stereotypes about my field might suggest). That set of choices could possibly conflict with other aspects of my personality at work, namely with how I take work extremely seriously and want to be judged solely on the merits of my work. All those considerations need to be taken in context of how I am actually fairly certain that it is entirely unnecessary to expend that much thought on how I dress, at least at this particular office. Because my office has a fairly permissive business casual dress code, I am entirely free to indulge in my desire to dress in "casual business casual," often with bring colors and/or loud prints except on days where there is an important meeting. Although I pulled out the business casual sooner than any other intern, I was never, by any stretch of the imagination, the most colorfully or the most casually dressed woman at the workplace. Because I still lean towards fairly conventional cuts and silhouettes, I will never be the most fashionable woman at work either. 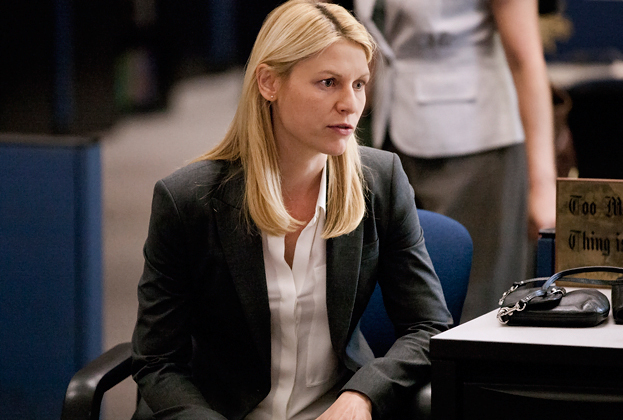 Carrie Mathison from Homeland also dresses very professionally, though in a much less deliberate and feminine way than Claire Underwood from House of Cards. Carrie's style is probably consistent with The Cut's characterization of Samantha Power's wardrobe: dresses professionally and appropriately, but not in a way that suggests being "way too busy to give a crap." Despite any possible thoughts I might have on the obstacles to equality for women at work in general and in my industry in particular, I am fully confident that, at my large company, no women is ever held back or at all negatively affected by what she chooses to wear to work. No person, male or female, ever commented on any woman's manner of dress in a negative way. Women sometimes chat amongst themselves to compliment this or that item of clothing (a no strings attached, no underlying implications compliment) or to express a wish to buy something similar. If left completely to my own devices and entirely without other people's opinions to consider, I would probably dress like Emma Pillsbury from Glee. That we don't have to worry about what we wear to work probably makes us quite lucky. Women in the public eye get arguably sexist scrutiny about their clothes all the time. There are industries that exert stronger pressure on women employees than men when it comes to what is and isn't an acceptable manner of dress. While that particular article argues that women in tech are becoming more free to dress fashionably, friends in the tech industry comment that if they were to adopt my "pencil skirts and ruffled printed tops" wardrobe in their office, they could well be seen as one of the "girls in marketing" rather than as serious computer scientist types. Although I hope that few women in contemporary times could attribute any career setbacks or other problems to what they wore at work, dressing for the office is something that naturally causes some anxiety. Even if career problems don't arise directly from what one wears, it is very normal to feel some pressure to conform or to dress a certain way. Friends in my field who work at smaller, male-dominated offices also report feeling more scrutinized. I can only speculate on why that would be the case, but the office must be more difficult to navigate when most co-workers are men. In some instances, it feels like a more cautious course would be to dress more formally, in jackets and suits, and to stick to more conventional colors like gray and navy. That style of dress might have some parallels to Claire Underwood's wardrobe in House of Cards, which the costume designer describes as being "about looking good but not standing out." I love what Claire Underwood wears, but I would not call it "not standing out". Her form fitting dresses would definitely feel out of place in my very male dominated field. But then again, because my field is engineering (public works not software) it could be viewed as impractical even though I spend most my days in front of my computer in my office. Interesting topic. For sure. I was initially surprised when I read the costume designer's comments because I certainly noticed Claire's style when watching the TV show (and I feel like a lot of people online point to her style as an inspiration). Once I started searching for screenshots to include in my post, I thought I might see what the costume designer was talking about. She looks fantastic because of how well everything fits. When I zero in on specific items, however, each is very conservative: mostly plain cotton button-downs with her suits (though not in the picture I included) and sheath dresses. She never seems to pick any color that isn't black, navy, gray, white, or cream. The clothes themselves generally don't have any attention-grabbing details. I can't quite figure out why her clothes seem to stand out so much when compared to what the women politicians on the show are wearing because most of them are dressing for the same business formal dress code!